Where do I use my Millets voucher code? Choose from the current offers available at NetVoucherCodes. Copy the promotional code if available and head over to the Millets main website. Begin adding items to your cart and then go to your shopping basket. Insert your Discount Code into the ‘Voucher Code’ box and click ‘Apply’. Fill in the rest of your details to complete your order. "Sign up to Unidays and receive 10% off any Millets order." "Discounts as high as 50% off in the Millets sale." "Great 2-for-1 deals in the Millets offers section, plus many more." Millets were originally founded over a century ago in the form of multiple companies merging together, initial successes were felt although unfortunately history wasn’t favourable to the company and the second world war ensured that struggles were endured by Millets. Fortunately in more recent times Millets have moved from strength to strength, serving generation after generation and have emerged as the strong highstreet name we are all familiar with. Millets presently are renowned for their great range of outdoor clothing, equipment and accessories. Catering for hobbies such as camping and hiking, or even sports such as running, cycling or skiing. You can find a massive variety of clothing at Millets for all the family, ranging from coats and jackets tops to trousers, accessories and footwear, plus many more. It’s been made easy to shop for your favourite hobby gear, simply browse through the camping or walking sections to find relevant equipment and accessories, or browse by activity to look more specifically. Millets are home to fantastic offers and generous discounts, take a look at the sale to find big savings or inspect their offers section for deals such as 2-for-1, mega-buys and more. Are you a student who loves braving the outdoors? Millets want to give you a helping hand, they’ve teamed up with Unidays to provide you with a student discount - if you have a valid Unidays account then you are entitled to a 10% discount off your order whenever you shop with Millets! Don’t forget to take advantage of the free delivery when you spend £70 or Millets’ newsletter, be the first to receive the latest news about special offers or discounts when you sign up. If you’ve been looking for a reason to renew your favourite hobby or even start a new one, then look no further. Millets is home to an offers section as well as a generous sale, both giving you the means to save generously on your order. It’s easy to bag a bargain on all your favourite outdoors brands like The North Face, Craghoppers or Berghaus, with special offers such as 2-for-1, lowest price or buy one get one half-price. 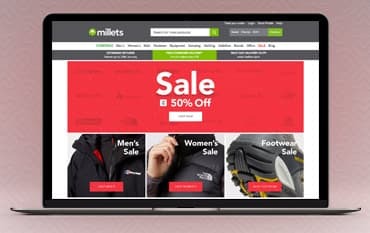 The Millets’ sale is home to discounts as high as 50% off, browse through it and save on all product categories such as camping, walking or footwear. UK Standard Delivery is £3.99 or free on orders over £70! Delivery takes 5 working days. Order before 6pm and receive your order tomorrow for £4.99! Standard Next Day delivery is available for items weighing up to 15kg and will arrive the following day to UK mainland addresses providing that the order is placed before 8pm. Deliveries will arrive between 8am and 8pm. Get full delivery details here. Millets offer a refund or exchange within 28 days of delivery or collection. Within 14 days of receiving your order, you must notify Millets of any items you would like to return. You then have 14 days in which to return the items to Millets. You must complete the returns form sent to you with the order and send it back to Millets with the items you are returning. Full details here. Millets’ opening times are relative to the retail centre they operate in, for more information please refer to the store locator featured on their website and find your local branch. Head office address - Millets, Edinburgh House, Hollinsbrook Way, Pilsworth, Bury, BL9 8RR. Millets are the outdoor store that we all know and love, they’ve been providing the United Kingdom with the very best in outdoor wear, equipment and accessories for decades. When it comes down to it, Millets have 3 product priorities that customers are ensured to receive when ordering from them: reliability, durability and style. These 3 factors are reflected in the brands the store stocks, which is why you’ll find only the best names here such as The North Face, Berghaus and Peter Storm, plus many more. Besides quality products, Millets understand their customers love a bargain above anything else - there are plenty of ways to save money on your order either through the sale or offers section, with even more savings potential when you shop with a Millets discount code from us.